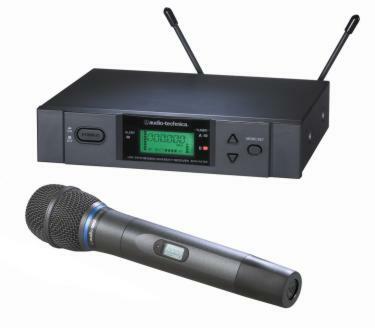 Audio Technica chose Namm summers session 2006 for introducing the ATW-T371 handheld cardioid condenser microphone/transmitter to its 200-channel, frequency-agile ATW-3171a true diversity UHF wireless system with automatic frequency scanning. Employing A-T's Artist Series ATM710 cardioid condenser element, the ATW-T371 wireless microphone is designed to be used as a handheld or mounted on a stand. The ATW-T371 features rugged metal construction, soft-touch controls and a multi-function LCD display. It is powered by two 1.5V AA batteries with a life of 6-8 hours. A dual power switch permits selection of high power for maximum range, or low for extended battery life. The 3000 Series is a 200-channel frequency-agile UHF wireless system designed for a wide range of applications including MI/live performance, regional touring companies, fixed installation, public address, A/V rental houses and places of worship. The automatic frequency scanning function automatically determines and sets the best available frequency (open channel). This is particularly useful when employing multiple wireless systems, thereby avoiding interference and intermodulation. Up to 16 simultaneous systems per frequency band are compatible, for a total maximum of 32 simultaneous systems across two bands. The 3000 Series systems and components are available in two UHF frequency bands: 541.500 to 566.375 MHz (TV channels 25-30) and 655.500 to 680.375 MHz (TV channels 44-49) with 200 selectable frequencies in each band. Soft-touch controls offer quick, easy access to the most important functions during set-up and operation. In addition, the 3000 Series features Audio-Technicas digital tone lock squelch plus an easy-to-read LCD information display in each unit that provides convenient visual indications of settings and operation status. The true diversity ATW-R3100 receiver features an all-metal housing for superior shielding, as well as dual independent receiver sections. Its true diversity operation selects the best signal from the two independent receiver sections, thus reducing dropouts and minimizing multipath distortion. The ATW-R3100 offers 200 PLL-synthesized UHF frequencies, advanced digital Tone Lock squelch, soft-touch controls with LCD information display, step-through menus to minimize set-up time, a meter hold setting function, plus an adjustable-slope high-pass filter (Off, 6 dB, 12 dB or 18 dB). The meter hold setting function permits the AF bar graph in the LCD window to capture and display the highest level audio modulation received from the transmitter. This function is particularly useful during setup or sound check. The ATW-R3100 also includes a transmitter battery-life fuel gauge, XLRM-type balanced and 1/4" unbalanced outputs plus a ground-lift switch and all rack-mounting hardware. © 1997 © 2006 Pro-Music-News. All rights reserved. Thank you for visiting Pro-Music-News.